You've probably heard me lament many times on Fb/Twitter about the lack of water at school. Well, the main water pump in our school is really old & in a poor state of repair. It breaks down or a pipe bursts every few months & immediately plunges the school into drought. Also, the speed in which repairs take place can drive a snail mad so we can go on for weeks without water being pumped into our lodgings. The situation gets worse when the mini-pumps at our apartment blocks break-down after an extended period of disuse. The record time for not having any water pumped into my apartment is 4 months: October 2013 - January 2014. Imagine you're a student who is sitting for SPM & you have to endure a drought throughout your preparation & exam. You have to endure no matter what & do your best in your tests. I really respect my students who went through SPM in such conditions last year. I wouldn't want anything like this to happen to me during an important period of my life. Imagine you're a teacher who comes from the city where you have taken for granted the constant supply of running water & electricity. You fly from your home & take 2 boats to get to school. You feel energised from the holidays & are eager to start the year with a bang. Yet, you return to find that nothing has been done to fix the water problem during the holidays & you've got to find a way to clean your filthy house, source for clean drinking water, prepare your meals & clean your dirty laundry. What would that do to your morale & those of the colleagues you depend on? No matter what, you have to survive & you have to stay focused. It's not easy. So what happens when there is no water at the jungle school? Where we bathe, do laundry, carry pails of water from, &, before I leave, I want to go skinny dipping. I really am thankful for the river which runs along the school. Although the river is not always clear & cheerful, sometimes it can be moody & murky or swollen & in a great hurry, it is a vital source of water. Both for us to draw from directly or for our pump to draw from on our behalf. When the pump breaks down, we trek to the river. 15 minutes from our lodgings. It is where we wash our bodies & our laundry. After we are done, we carry a pail of water or two back for our needs at home. You know, for cleaning veges & flushing. River water looks like this. Not exactly Evian water. But, students drink water like this. With or without the water pump functioning. You must be wondering what I drink. I never drink the water. Even when the pump is working. I am willing to carry boxes of mineral water from town onto a boat to my school & carry it all the way to my apartment. When there is no water, I use the same mineral water in my cooking. I use river water to wash the produce & dishes. My cooking is also severely limited to water conserving methods. I usually put everything for lunch & dinner into my rice cooker. Not the best tasting or looking but I survive. When there is water, I filter the water for my cooking. God's answer to our prayers! Clear water right to our doorsteps! Yes, we vandalised the storm-drain pipes. When there is rain... I just want to dance!!! It's the best thing to happen when the pump breaks down! 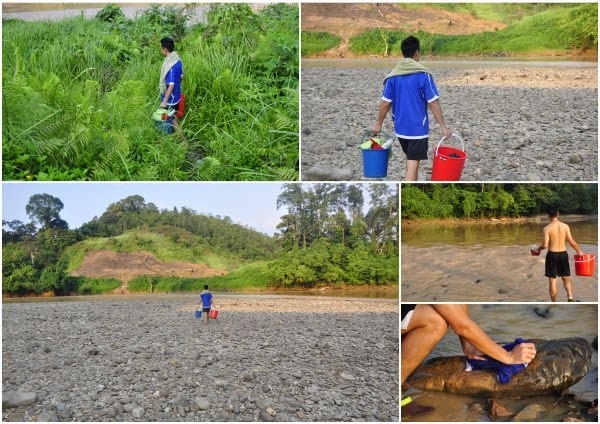 This means that we can fill up all our tanks, bins & pails without having to repeatedly walk 15 mins to the river & back with a heavy load of water! This is also the best time to do some washing - clothes, dishes, mopping, flushing your toilet, etc. Some people even take their baths during the rain. If you have constant running water, appreciate what you have guys. You won't know what you have until you lose it. Also, have some respect for teachers who work in similar conditions. I know teachers who travel into schools more interior than mine & endure conditions worse than mine. They have my deepest respect. Instead of being so quick to condemn us, walk a mile in our shoes & help us be the best teachers that we can be.